Oh, hello there, buttery, flaky pastry, spun like a bird’s nest to encircle a molten dollop of Nutella! This deliciousness is coming to you from See & Be Kitchen, a brand new destination-worthy bake shop (which will be open for breakfast, lunch, and some pre-ticketed dinners starting this summer) on Route 145 in Cairo. 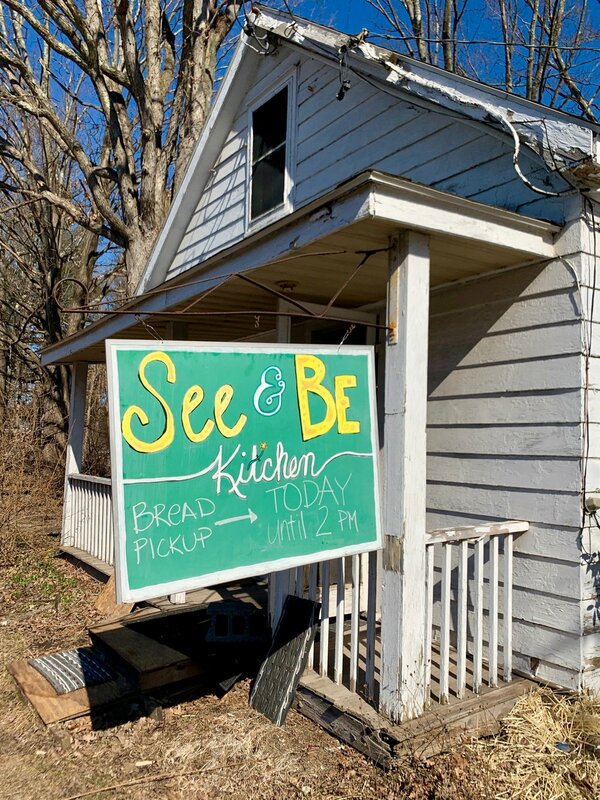 The owners of See & Be are a husband-and-wife team that just had a baby and should probably be taking a family leave and binge-watching some Netflix, but no, they’ve decided to change the Greene County bakery game instead. The duo includes Chrissy Traore, who is currently the executive chef at the Glen Falls House restaurant, Trotwood, was recently the chef at Westwind Orchard in Accord, and also ran the fleet at Brooklyn’s Pizza Moto for years. Her husband, Ben Salif Traore, was head vienoissier at Bien Cuit in Cobble Hill, Brooklyn, and he was also the head baker at Saraghina Bakery in Bed-Stuy, Brooklyn. He started out in pastry at The Dutch in Manhattan. In short, this place is legit. Even without the pizza toppings, the plain focaccia is something to behold—so glossy and densely delectable. And when we visited, the special of the day was a decadent little ham and cheese croissant, kissed with a spicy-sweet mustard glaze. A friendly guy from Tire Kingdom across the street came over to chat with Chrissy and buy a couple for his crew. Though the baked goods may sound a little fancy-schmancy, the vibe at See & Be is totally warm and welcoming. With neighbors hugging and chatting in line, it feels like it’s been around forever. Here’s their sticky-sweet cinnamon bun (another major winner!) posing on our deck beside some slider-ready milk buns (a cross between a slider roll and a potato roll). The customer from Tire Kingdom said the shop reminded him of a gingerbread house—it seems like a plain little cottage from the outside, but the moment you walk in the door, you’re faced with piles of treats and hit with the most delicious aromas. The wood-paneled walls add to the feeling that you’re tucked inside a little house made of graham crackers and magic. At present, See & Be’s hours are limited to 3 to 6pm on Thursdays and 10 to 2pm on Saturdays, but they’re hoping to open as a cafe and add more hours in the future. For bigger orders (or to make sure you get exactly what you want before they run out), you can place an advance-order online. The website is very user-friendly, and you can always add on to your order once you get to the shop. See and Be Kitchen is located at 512 NY-145, Cairo, NY. Check their website for current hours and additional pick-up locations. At the moment, they’re open Thursdays from 3-6pm and Saturdays from 10am-2pm.